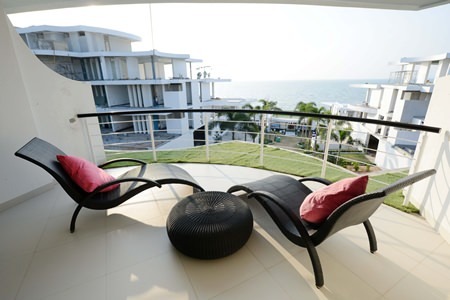 Pure Sunset Beach, which classes itself as the only low-rise luxury condominium in Na Jomtien, officially opened its first phase in grand style last month. Hundreds of invited guests and media attended the November 22 launch party and had their senses dazzled by a lavish collection of art, music and fashion, plus a most stunning sunset. “The first time I experienced the magical moment of the sun setting on this very beach, I instantly knew I wanted this project to be a masterpiece,” said Nicolas Buchler, the architect behind the design of this real estate project. 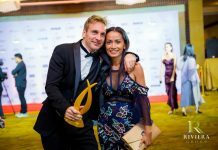 “I was inspired to create architecture that is at one with nature and allows those who reside here to truly feel the spirit of Tawan Ron beach. Each building is designed to mimic the slope of the surrounding hills, so each unit has a panoramic view of the sea. The units are spacious, airy and comfortable. With the low-rise buildings, residents will truly be able to feel the beach atmosphere,” he said. 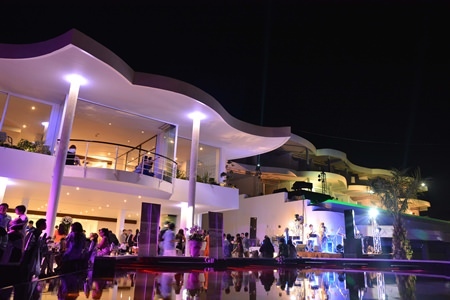 Developers of Pure Sunset Beach in Na Jomtien celebrated completion of Phase 1 of the project with a lavish art & fashion themed party on November 22. Buchler has designed many of the project’s features to be as eco-friendly as possible, from its waste water management system, the rain water filter system, LED light system, energy-efficient elevators from Japan, solar powered lights and water heaters, designs which allow for less use of air conditioners by allowing in natural breezes, heat insulation and awnings, all of which incorporate many types of innovation that ultimately makes life comfortable but is also environmentally-friendly. The project, say the developers, is constructed to the highest European standards. 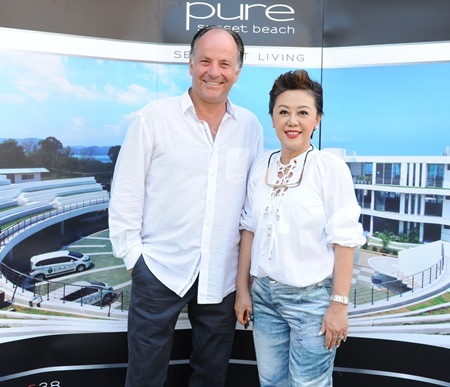 Architect Nicolas Buchler (left) and director of marketing and sales Naparat Sihanatkathakul (right), the driving force behind Pure Sunset Beach. On display during the grand opening was an art exhibition by renowned artist Anurak Tangsomboon plus a limited edition fashion collection from Vareenithi Kanpaibool, designer and owner of Virithorn Boutique. Vareenithi said she had derived inspiration for much of her “Sea Breeze” collection during her first visit to Pure Sunset Beach. “Since the first time I came here, I was inspired to design fabric patterns based on the waves, as if the waves were literally rolling from the sea, into the beach, and then onto the fabric. I chose the palette which gave movement to the fabric, which was used for our beach ware,” she said. 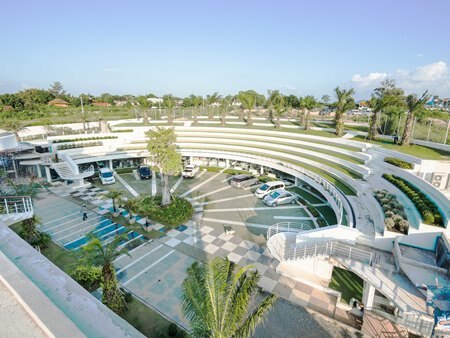 As guests celebrated the official opening of building E, the last building in the first phase of the project, Koh Mr. Saxman serenaded those in attendance with his sultry jazz music, while upbeat songs were performed by singer Joom Nareekrajang. The development aims to be fully eco-friendly with buildings designed to mimic the slope of the surrounding hills. Prices at Pure Sunset Beach start from 120,000 – 210,000 baht per sqm. 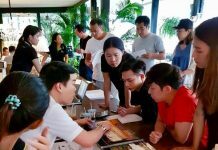 The first phase includes a total of six buildings, with a combined total of 110 units, which are studios, one-bedrooms and penthouses ranging from 33sqm to 208sqm in size and 4.2 – 40 million baht in price, depending on the unit size and location. Special promotions are available for those reserving units priced at 17 million baht or above. They will receive a personalized 24k gold limited edition iPhone 6 designed by Golden Dreams from Geneva, Switzerland. Guests enjoy the lavish opening party on November 22.